To celebrate the first five years of operation on board the International Space Station, Professor Sam Ting, the spokesperson for the Alpha Magnetic Spectrometer (AMS-02) Collaboration just presented their latest results at a recent seminar held at CERN. With a sample of 90 million events collected in cosmic rays, they now have the most precise data on a wide range of particles found in outer space. Many physicists wonder if the AMS Collaboration will resolve the enigma on the origin of the excess of positrons found in cosmic rays. Positrons are the antimatter of electrons. Given that we live in a world made almost uniquely of matter, scientists have been wondering for more than a decade where these positrons come from. It is well known that some positrons are produced when cosmic rays interact with the interstellar material. What is puzzling is that more positrons are observed than what is expected from this source alone. Various hypotheses have been formulated to explain the origin of these extra positrons. One particularly exciting possibility is that these positrons could emanate from the annihilation of dark matter particles. Dark matter is some form of invisible matter that is observed in the Universe mostly through its gravitational effects. Regular matter, everything we know on Earth but also everything found in stars and galaxies, emits light when heated up, just like a piece of heated metal glows. Dark matter emits no light, hence its name. It is five times more prevalent than regular matter. Although no one knows, we suspect dark matter, just like regular matter, is made of particles but no one has yet been able to capture a particle of dark matter. However, if dark matter particles exist, they could annihilate with each other and produce an electron and a positron, or a proton and antiproton pair. This would at long last establish that dark matter particles exist and reveal some clues on their characteristics. An alternative but less exotic explanation would be that the observed excess of positrons comes from pulsars. Pulsars are neutron stars with a strong magnetic field that emit pulsed light. But light is made of photons and photons can also decay into an electron and a positron. So both the pulsar and the dark matter annihilation provide a plausible explanation on the source of these positrons. To tell the difference, one must measure the energy of all positrons found in cosmic rays and see how many are found at high energy. This is what AMS has done and their data are shown on the left plot below, where we see the flux of positrons (vertical axis) found at different energies (horizontal axis). The flux combines the number of positrons found with their energy cube. 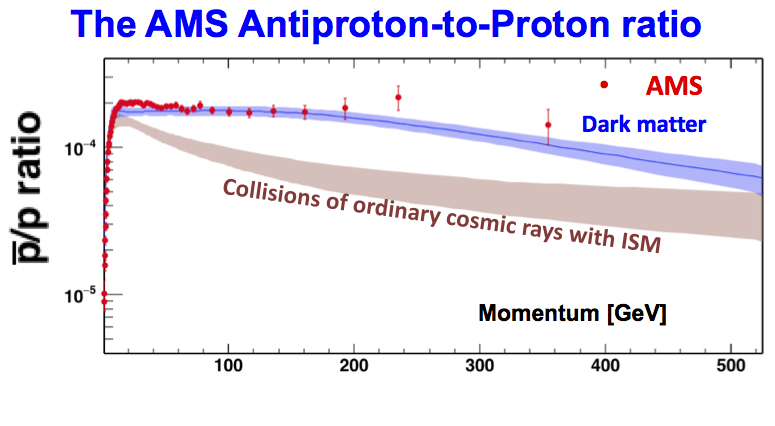 The green curve gives how many positrons are expected from cosmic rays hitting the interstellar material (ISM). If the excess of positrons were to come from dark matter annihilation, no positron would be found with an energy exceeding the mass of the dark matter particle. They would have an energy distribution similar to the brown curve on the plot below as expected for dark matter particles having a mass of 1 TeV, a thousand times heavier than a proton. In that case, the positrons energy distribution curve would drop off sharply. The red dots represent the AMS data with their experimental errors shown by the vertical bars. If, on the other end, the positrons came from pulsars, the drop at high energy would be less pronounced. The name of the game is therefore to figure out precisely what is happening at high energy. But there are much fewer positrons there, making it very difficult to see what is happening as indicated by the large error bars attached to the data points at higher energy. These indicate the size of the experimental errors. But by looking at the fraction of positrons found in all data collected for electrons and positrons (right plot above), some of the experimental errors cancel out. AMS has collected over a million positrons and 16 million electrons. The red dots on the right plot show the fraction of positrons found in their sample as a function of energy. Given the actual precision of these measurements, it is still not completely clear if this fraction is really falling off at higher energy or not. The AMS Collaboration hopes however to have enough data to distinguish the two hypotheses by 2024 when the ISS will cease operation. These projections are shown on the next two plots both for the positrons flux (left) and the positron fraction (right). As it stands today, both hypotheses are still possible given the size of the experimental errors. There is another way to test the dark matter hypothesis. By interacting with the interstellar material, cosmic rays produce not only positrons, but also antiprotons. And so would dark matter annihilations but pulsars cannot produce antiprotons. If there were also an excess of antiprotons in outer space that could not be accounted for by cosmic rays, it would reinforce the dark matter hypothesis. But this entails knowing precisely how cosmic rays propagate and interact with the interstellar medium. Using the AMS large sample of antiprotons, Prof. Sam Ting claimed that such excess already exists. He showed the following plot giving the fraction of antiprotons found in the total sample of protons and antiprotons as a function of their energy. The red dots represent the AMS measurements, the brown band, some theoretical calculation for cosmic rays, and the blue band, what could be coming from dark matter. 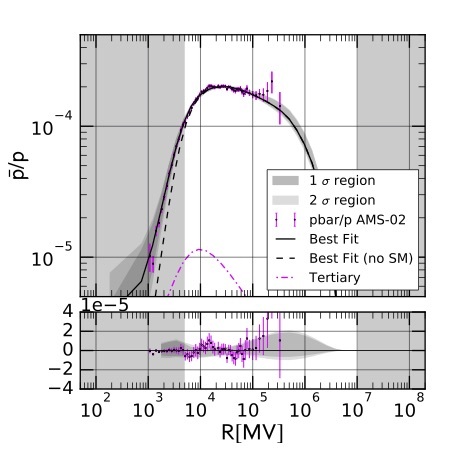 This plot clearly suggests that more antiprotons are found than what is expected from cosmic rays interacting with the interstellar material (ISM). But both Dan Hooper and Ilias Cholis, two theorists and experts on this subject, strongly disagree, saying that the uncertainty on this calculation is much larger. They say that the following plot (from Cuoco et al.) is by far more realistic. The pink dots represent the AMS data for the antiproton fraction. The data seem in good agreement with the theoretical prediction given by the black line and grey bands. So there are no signs of a large excess of antiprotons here. We need to wait for a few more years before the AMS data and the theoretical estimates are precise enough to determine if there is an excess or not. The AMS Collaboration could have another huge surprise is stock: discovering the first antiatoms of helium in outer space. Given that anything more complex than an antiproton is much more difficult to produce, they will need to analyze huge amounts of data and further reduce all their experimental errors before such a discovery could be established. Will AMS discover antihelium atoms in cosmic rays, establish the presence of an excess of antiprotons or even solve the positron enigma? AMS has lots of exciting work on its agenda. Well worth waiting for it!